Improving Your Workplace Communication and Brand Experience with Audiovisual Technology Starts Here! Your company’s next breakthrough is coming through real-time communication and collaboration, no matter where you are! The technology you use to communicate has a significant impact on how your employees will communicate and this ultimately impacts your business. Learn how to break down communication barriers and transform your corporate culture by following the proven methodology found in this guide! Show you how to use a holistic strategy to make smart purchases that will have a maximum impact when selecting AV technology and redesigning space. Give you the five critical steps you must undergo to take away the guesswork when making decisions on projects of this scope. Detail how we leveraged our experiences with clients and our staff’s feedback to create the Audiovisual Ecosystem — a framework any company can use to improve their workplace. Explore the latest in products and solutions from our top Audiovisual Ecosystem partners that are improving the way people communicate and collaborate in workplaces across the world. Audiovisual communication continues to be the most powerful medium to express and execute ideas. HB was one of the very first audiovisual companies, founded back in 1946. Our team has implemented some of the most challenging and sophisticated system integration projects in the world and continues to work with clients every day to help them evolve their communications. Discover how the right audiovisual technology strategy will improve your workplace communication. 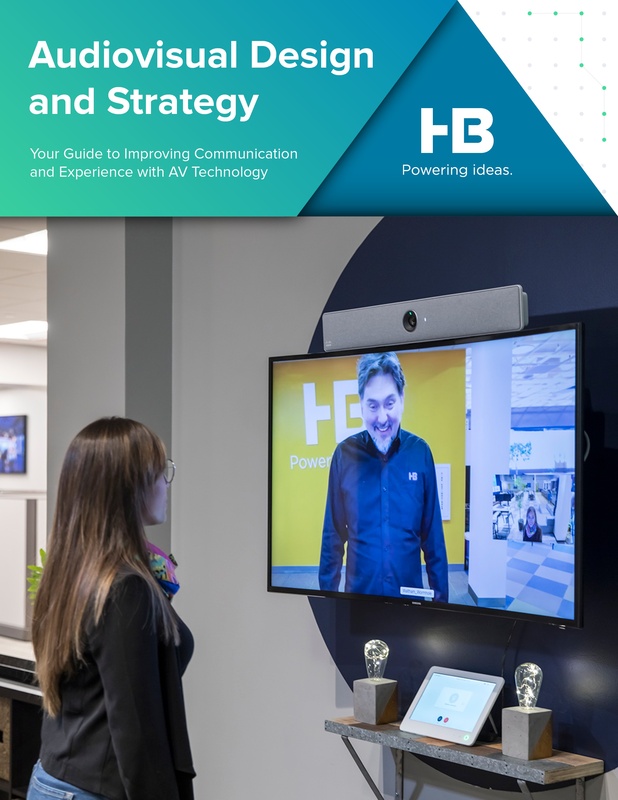 Connect with HB for more about our audiovisual solutions.